We are so excited to reveal the new print swimwear collection from Close which focuses on the plight of our endangered species. Close have recently joined 1% For the Planet and are partnering with the WWF and Marine Conservation Society. This means that 1% of the sales in the Endangered Species collection will go directly to helping protect and conserve wildlife habitats and endangered species living within them. The new swimwear range will come in two new prints featuring some of our most charismatic endangered marine creatures. Whale features the Blue Whale – our largest marine mammal – and the Albatross, with the largest wingspan of any living bird. Both face the daily threat from plastic ingestion and food shortages due to decreasing fish stocks from overfishing. The second new print is Turtle, featuring the Hawksbill Turtle and the Seahorse. Sea turtles are at great risk from plastic pollution as they often ingest plastic bags mistaking them for jellyfish, their natural food source. The delicate seahorse faces many problems putting them on the endangered list, from habitat destruction to overfishing for the pet trade. Both the new prints are bright and fun, the colours coordinating across the range. 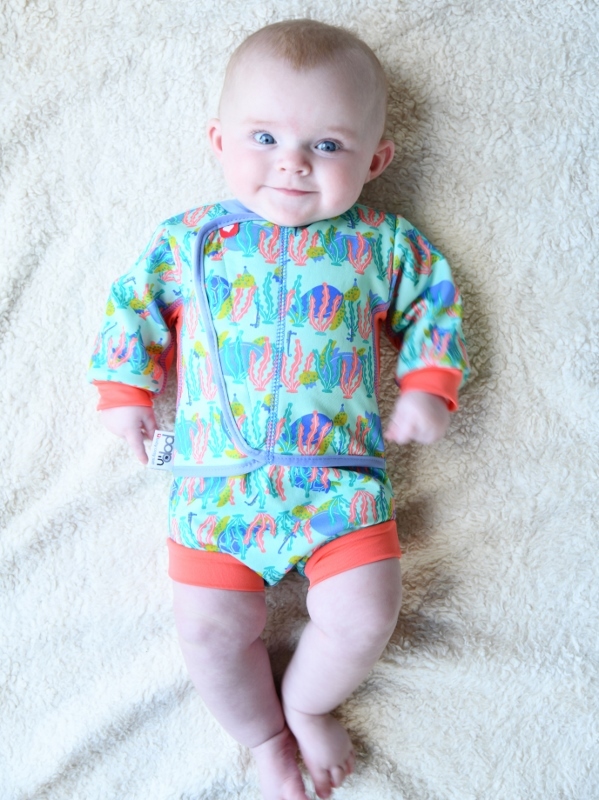 This means you can match up your swim nappy with a rash vest or snug suit and sunhat in the same great prints. 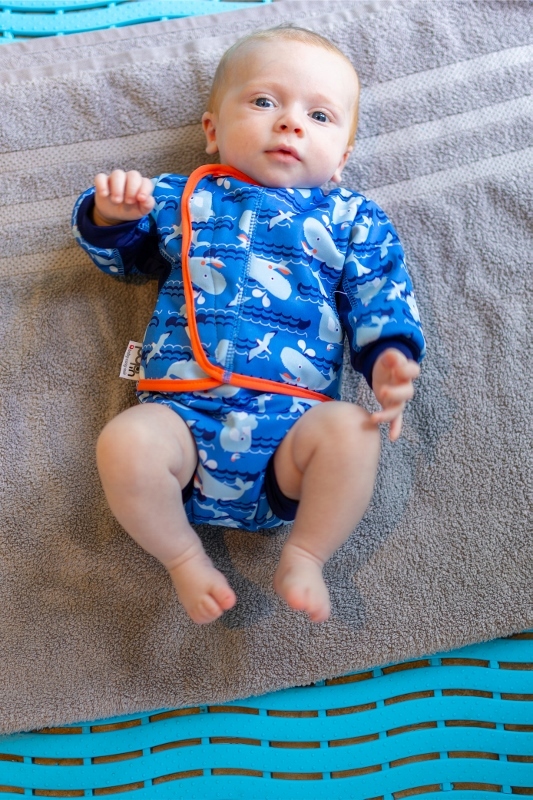 Close Pop-in washable swim nappies are perfect for baby swim classes as well as the beach. They are made from UPF 50+ sun protection fabric to protect your baby’s delicate skin and a unique ‘seal to skin’ binding to contain any number twos. What’s new? Close have added a new drawstring waistband to help give a better fit between sizes. These come in six sizings for the perfect fit, but we think they come up a little small so if in doubt go up by one or two sizes. 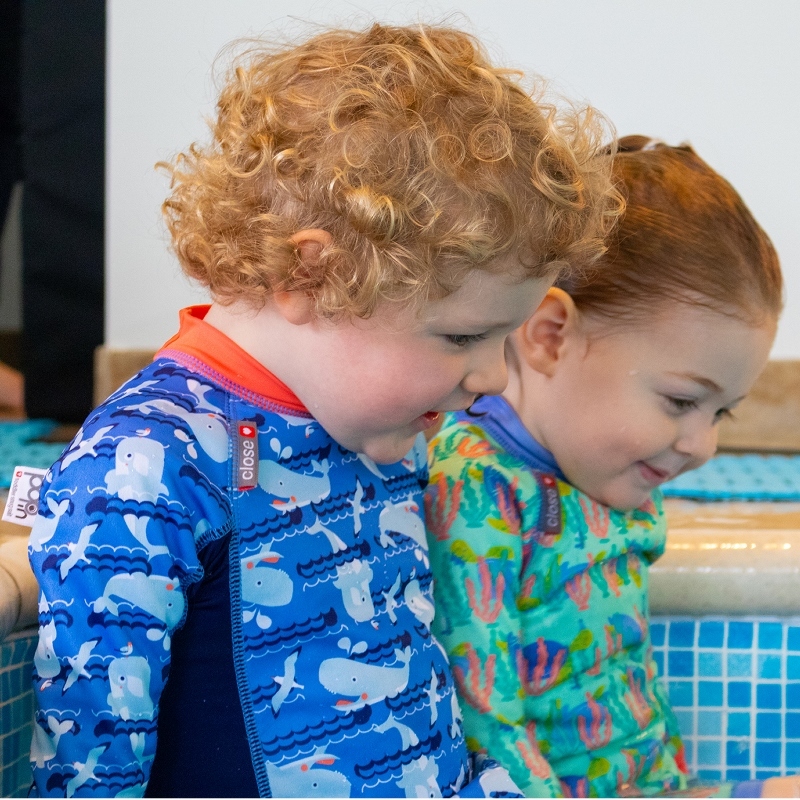 These suits are perfect for keeping your snuggly and warm in the pool of beach, with a soft fleece lining and integrated swim nappy. Again with built in sun protection, and stain resistant so great for fun at the beach. What’s new? The cosy suits come in two sizes, small (0-6 months) and medium (6-12 months) that have been updated to be more generously sized than the previous range. Your little one will stay warmer in the water for longer with this cosy fleece lined swimsuit. With the same sun protection and stain resistance as the baby cosy suits, these are the next stage swimwear for your toddler. The smaller sizes are cut for cloth so a swim nappy can be used underneath if needed, and poppers at the crotch for quick toilet trips and nappy changes. What’s new? Now coming in bigger sizes to cater for older children. There are five sizes altogether and the age range is a guide only – if in doubt size up as these are designed to be tight fitting and are rather a small fit. A great cover up at the beach, the all-in-one has a sewn in beach hat to protect your child from the suns rays. It is made from UPF50+ fabric, and has long sleeves and knee length shorts giving excellent coverage. Designed to fit a swim nappy underneath if needed and with poppers on the crotch of the smaller of the two sizes, nappy changes or toilet trips should be quick and easy. What’s new? Bigger sizes! Now you coming in five sizes to cater for older children. As with the toddler snug suit though the age range is just a guide, these are coming up on the small size, so if in doubt size up! The popular peaked sunhat is perfect for the summer, providing excellent sun protection across the back of your child’s neck and ears. Rash vests provide a quick and easy solution to added sun protection on the beach – just pop it on with a swim nappy or shorts to protect your child’s top. As with the whole swimwear range they are ethically made from UPF50+ fabric. Both and long sleeve rash vests are available. What’s new? You can now get sun hats and rash vests up to ages 4-5 years! The long sleeve rash vest is a new addition to the Close Pop-in swimwear collection, and provides increased sun protection. They come in solid colour with coordinating coloured sleeves that can be mixed and matched with other items in the swimwear range. We love the new prints and improvements to the design of the new swimwear collection – your child will be both stylish and safe in the sun. What’s more, you’ll be helping to protect the planets ocean habitats while having fun at the pool or beach. Next story What is Real Nappy Week?